At a time when Tesla has been making news around the world, our own Terragong House has become the Illawarra’s first destination charging station for the revolutionary electric car. Earlier this month, when the US based Tesla started taking orders for its Model 3, an extraordinary 325,000 reservations were placed in the first week (reported as implied future sales of $14 billion). There is currently thought to be 1000 Tesla vehicles in Australia, but Jude Burger, President of the newly formed Tesla Owners Club, believes that number is set to rise. Freely admitting to being an early adopter of new technology, Jude was amongst the first Australians to order her Tesla online and is one of those who has placed an order for the new smaller model. The car’s software is continually being improved, with updates installed overnight through an internet chip. “It just keeps getting better and better,” says Jude. Amongst other things, she says it is very high performance, can park itself, and you can even summons it to bring itself out of the garage. 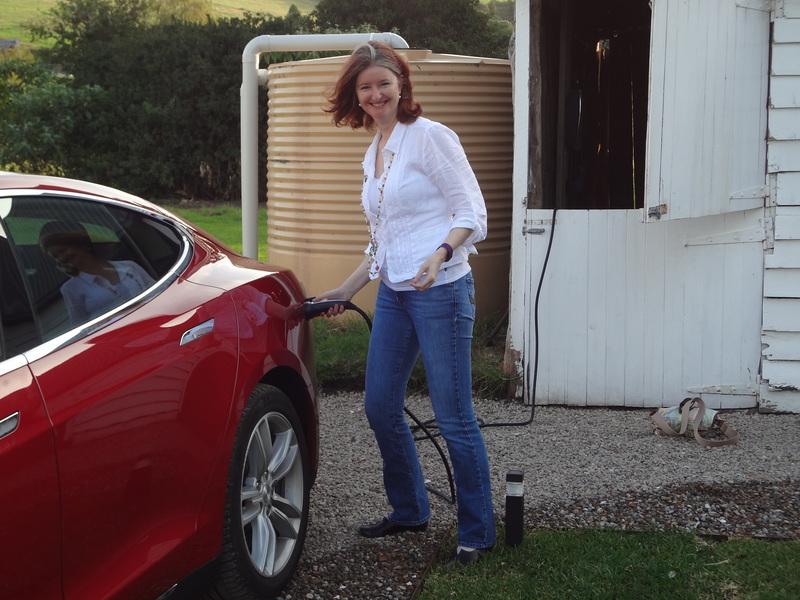 Jude says that when fully charged, her car can easily travel from Canberra to Sydney. Super charging stations have already been set up along the length of the Hume, and are planned for other major routes around Australia, to charge Telsas in a matter of minutes. The only thing stopping us from all going out and buying one at this early stage is the pricetag – upward of $125,000. than $7 a week to top up elsewhere.